All I can say is "Oy". Ok, clearly that's not all I can say...the other day I was estimating the number of words I've typed these past 5 years on this blog and figured it was near a million. Kids' brains grow incredibly fast. In fact the brain nearly quadruples in the first five years of life. Up to 20% of the human brain is made of DHA, yet most kids don't get their recommended DHA from common dietary sources like fish. 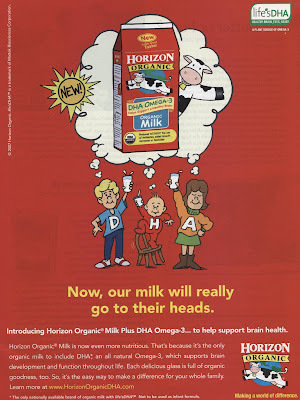 By making Horizon Organic Milk Plus DHA your family choice, you're bringing home all the goodness of organic plus an extra nutrtional boost for growing mids and bodies"
So how much DHA do you get per glass of this miracle brain milk? According to the Center for Science in the Public Interest 32mg of DHA is less than what you'd get from a single bite of salmon. Save your pennies by not buying this badvertised milk and use them to buy your kids at least one weekly serving of fish instead. Their brains (and yours) will thank you.